Iwobi inspires Eagles’ win against ‘Messi-less’ Argentina. Alex Iwobi scored twice as Nigeria fought back from 2-0 down against an Argentina side missing Lionel Messi to secure a stunning 4-2 friendly victory in Krasnodar. Having drawn level with Hernan Crespo by scoring a late winner against the Russians, Aguero followed up his first international goal since June 2016 by tapping home Argentina’s second to back up Ever Banega’s free-kick opener. Yet their comfortable cushion evaporated either side of the interval, with Kelechi Iheanacho inspiring a Nigeria fightback with a free-kick of his own in the closing stages of the first half. Two goals in the space of three second-half minutes from Iwobi and Bryan Idowu swung the game further away from Argentina, with the former then slotting home a fourth to secure Nigeria just their second ever win over their South American opponents. The astonishing turnaround came after Banega’s 28th-minute free-kick gave Sampaoli’s side a deserved lead – albeit they needed help from goalkeeper Daniel Akpeyi to break the deadlock. After nudging the ball outside his own penalty area, a careless Akpeyi curiously allowed Aguero to quickly close the gap, forcing him to pick it up to prevent embarrassment. He did not escape punishment for his error, however, as Banega curled the resulting set-piece opportunity into the net, Akpeyi opening up further space to target by taking an unnecessary step behind his wall. Aguero added a second eight minutes later to move clear of Crespo, the striker tapping home Cristian Pavon’s low cross from the right, and at that stage Argentina were coasting. 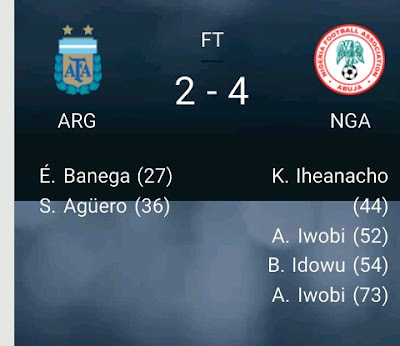 Nigeria had barely threatened in the first half but still managed to get back in the game, Iheanacho following Banega’s example by scoring from a free-kick in the final minute of the first half. We turned around a 2 goal deficit to beat Argentina. The Leicester City striker’s effort came after he had earlier left an impression on Nicolas Otamendi, catching his former Manchester City team-mate with an elbow. Yet Iheanacho escaped with only a yellow card and, after halving the deficit, he heaped further pain on Argentina by setting up Nigeria’s quick-fire double after the break. After providing the square pass from the right that allowed Iwobi to sweep home an equaliser, the 21-year-old forward played in Idowu to curl a right-footed effort beyond goalkeeper Agustin Marchesin. Hit by a one-two combination, Argentina struggled to mount a response as they looked to get back on level terms in a game that had somehow escaped from their grasp. With no Messi to inspire any late heroics, Iwobi wrapped up the victory for Nigeria, the Arsenal forward finishing with his left foot after swerving his way beyond Javier Mascherano.